It's not all that often that Main Street of a town is closed to traffic due to a reason other than an emergency, but the barricades were up in Biggsville the evening of Thursday, June 5th. 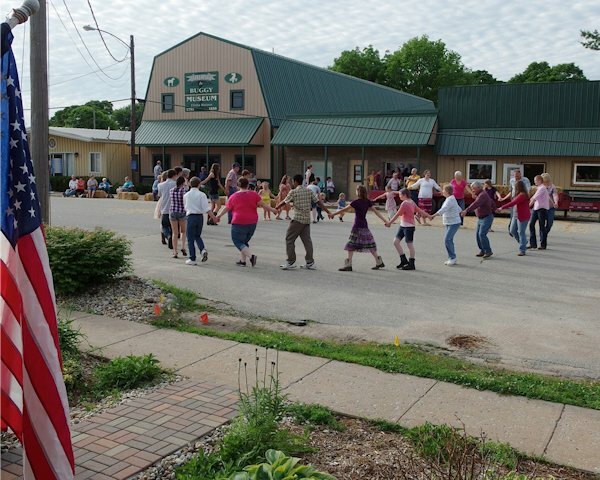 While just a few miles to the south, roads were closed off due to the ongoing construction on Highway 34, this particular instance was something different: a square dance. The evening started at 5:00 p.m. with a free-will donation meal served by area volunteers in the Biggsville community building. All proceeds from the night went to Family Outreach Community Center (FOCC) , a non-profit organization that provides services to families in Henderson County. of Main St. do-si-doing and promenading their partner. It was a lot of fun, comments Nathan Defenbaugh, 16 of Kirkwood.. The dancing was my favorite part. added her younger sister Sidney. As the dancing commenced, attendees were also encouraged to tour the Biggsville Museum and Hotel Lynn, providing those from outside the immediate area an opportunity to learn about the history of Biggsville. Terri Dean of Monmouth commented on how she & liked being able to go into Hotel Lynn and understand the history about it. I liked the Museum also. It was fun to be with a lot of great people. After an hour of dancing, five cakes were auctioned off to the highest bidder, followed by a $.25 cake walk. After the intermission, the music started up again, this time with more intricate steps as the dancers gained experience throughout the evening. July 21st, and the 2nd annual 5K Color Run August 2nd. All FOCC events are open to the public, with all Henderson County residents encouraged to attend.